Prepare the Tomato-Almond Pesto first. It will be more than you need so you could freeze it for another time. Put the sun-dried tomatoes in a food processor or blender. Add the almonds, parmesan, garlic and olive oil and blend until you get a smooth paste. 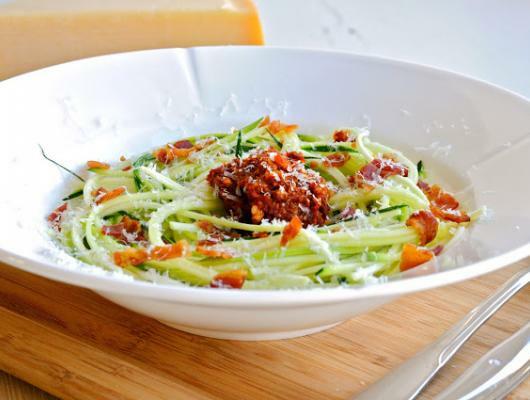 Prepare the zucchini spaghetti by slicing it lengthwise on a mandolin. Place the spaghetti in a bowl and sprinkle with a little salt and drops of olive oil and lemon. Prepare the pancetta by cutting into small pieces and frying in a dry pan until crisp. Transfer the crispy pancetta onto a plate between 2 paper towels and let it soak a bit of fat. 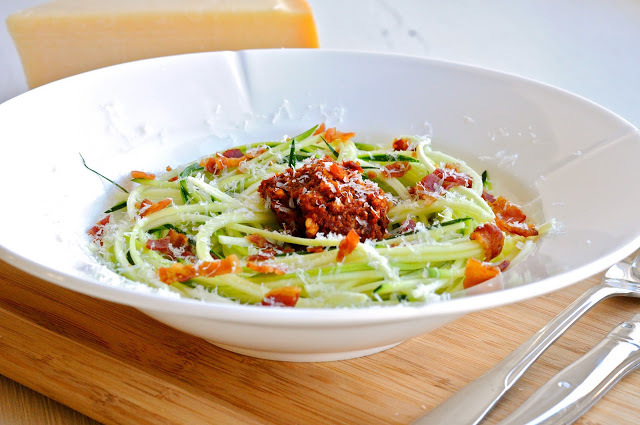 Zucchini Spaghetti is one of the best dishes I know. It’s easy to make, it’s healthy and it can be combined with all the normal things that goes well with spaghetti. Actually it’s even easier to make, healthier and less fattening, tastes better, and will impress most people since it’s so elegant.